If an ink cartridge is expended, you see a message on the LCD screen. 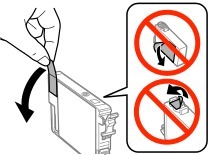 Note which cartridges need to be replaced, then select Proceed and follow the instructions on the screen. 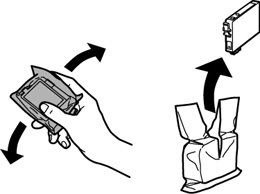 If you are replacing a cartridge before you see a message on the LCD screen, press the home button and select Setup > Maintenance > Ink Cartridge Replacement. Gently shake the new cartridge four or five times as shown. Then remove the cartridge from the package. Do not remove any labels or seals, or ink will leak. Do not touch the green chip on the cartridge. 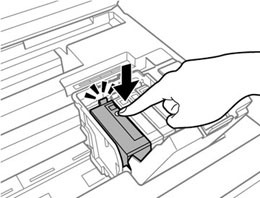 Install the new cartridge immediately after removing the old one; if you do not, the print head may dry out and be unable to print. Remove only the yellow tape. Insert the new cartridge into the holder and push it down until it clicks into place. Close the cartridge cover and push it down until it clicks into place. 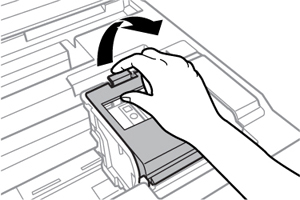 Select Check on the LCD screen to make sure the cartridge or cartridges are installed correctly. 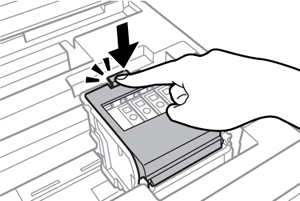 If you see a message that an ink cartridge is installed incorrectly, lift up the scanner unit, open the cartridge cover, and press the ink cartridge down until it clicks into place. Then close the cartridge cover. Close the scanner unit. The product starts priming the ink. This takes a few minutes. When you see a completion message on the LCD screen, ink replacement is complete. 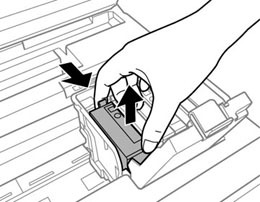 If you remove an ink cartridge for later use, protect the ink supply area from dirt and dust and store it in the same environment as the printer. The valve in the ink supply port is designed to contain any excess ink, but do not touch the ink supply port or surrounding area. Always store ink cartridges with the label facing up; do not store cartridges upside-down.